Every company, no matter how big or how small, wants to improve. The problem is that there are often ideas or improvements that never make it past the suggestion box or get lost in the shuffle. If improvements get lost or clogged up, it’s that much more difficult to get better. That’s where continuous improvement software comes in. We know that all staff members want to make a difference in the organization. The problem is that most of the time, the trouble they'd have to go through to make minor improvements isn’t worth it. Whether they don't know who to report the idea to, have no place to capture it, have to wait for a lengthy review process before getting started, or feel like no one cares, it's pretty common for people to just let go of their ideas for improvement. We believe that everyone in the organization has two jobs: to do their work, and to improve it. Using continuous improvement software, everyone can do just that. From the leaders of the organization to the staff on the front-lines, all employees can record tasks, track improvements, measure the successes. Continuous improvement software is great at tracking top-down strategic initiatives as well as the small bottom-up improvements for everyday processes. Cloud-based software makes it easy to communicate to all team members and team leaders from one central location. Instead of reading through multiple email threads, anyone can be quickly caught up by checking the project’s updates and comments. Based on proven concepts such as Kaizen Boards and Kanban, the use of digital boards to keep real-time progress of all your projects and improvements lets anyone input from any location. Many teams use a combination of email, text messages, phone calls, group chats, and other applications to keep track of their projects and other responsibilities. Continuous improvement software puts news, updates, and comments all in one place to streamline communication and eliminate the waste of having to use and combine information from different places on your phone, tablet or laptop. Part of improving is quickly getting those ideas from the drawing board to the work space. We’ve found that teams who use continuous improvement software end up pursuing over ¾ of the improvements that their staff captures. The one of the best features is being able to track your improvement from start to finish and having the satisfaction that your improvement made a difference. You can then share that improvement with others throughout your organization. Leaders that provide their organizations with continuous improvement software give teams the tools they need to avoid bottlenecks, skip tedious spreadsheets, and stop playing catch-up during meetings so that valuable time can be spent accomplishing goals. Eliminating waste in the workplace is one way that using continuous improvement software can increase efficiency and implement improvements. Teams are often provided with many tools to help them get the job done. Instead of having different tools spanning many platforms, continuous improvement software is one tool that tracks everything. Waste in the workplace can include copying information across all locations or using different methods of communication to keep everyone up to date. Using continuous improvement software can eliminate this waste and get improvements in motion instead of bouncing from one digital device to the next. Good continuous improvement software includes reports to track the progress and impact of all improvements. Being able to track an improvement from start to finish (and beyond) proves the value of improvement to both leaders and staff. Most organizations struggle to capture the impact of improvement on financials, quality, safety, efficiency, and satisfaction. Organizations using continuous improvement software don't have that problem. When each improvement is completed, the impact is logged in the software platform, which then calculates the total impact in reports that enable you to drill down into any level. Using advanced metrics made possible by continuous improvement software, staff will be more apt to find and suggest improvements when they can see direct results. Additionally, leaders can measure teamwork in action, track the rate of improvements and see which teams might need a bit more help. Continuous improvement software does a great job of giving tangible results or “keeping score”, something that is very difficult to keep track of in a fast paced environment. Regardless of industry, leaders and staff need a few things. Leaders need the ability to overview projects, measure work flow and tangibly see results and metrics while staff need the right tools to get the job done. Staff often have different tools to suggest improvements, work on projects, and communicate with each other. 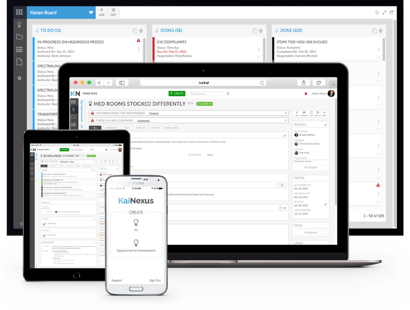 The beauty of KaiNexus’ continuous improvement software is that it includes all of these tools (and more) in a single cloud-based platform. When organizations struggle to promote engagement, accelerate improvement, and measure the impacts, continuous improvement software will help. Getting better leads to increased work flow, increased productivity, and increased profitability. Are you a non-profit? Then getting better leads to increased efficiency and will increase the benefits for the community or mission that you serve.